Front row: Billy Congleton, Evan Perdue, Evan Ezell, Eric Lindsey, Jason Rothwell, Jason Burgess, Matt Hill, Seth Mayfield. After winning the 2016 Kentucky State Cup in Bowling Green, KY, Lynagh’s FC – largely comprised of players from Central Kentucky Adult Soccer’s Yellow Fever and Sparkle Unicorn teams – competed in this year’s Region 2 Tournament of Champions Men’s Open Division. The Region 2 Tournament of Champions features some of the top talent from Kentucky, Ohio, Michigan, Wisconsin, Illinois, Indiana, and Kansas, including the state champions from each state and last year’s Region 2 Tournament of Champions winner. 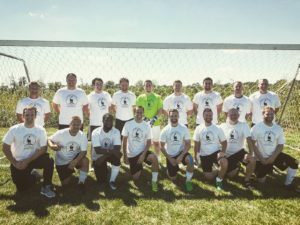 Representing a team from Lexington for the first time in the tournament’s storied history, Lynagh’s FC more than held its own. The team, which had an age range of 23 to 50, not only showed it could still hang with the young guys, it proved it could still play and win. Yes, the Lynagh’s FC Llamas were serious this weekend, and they’ll be back.